Turkish third division club Sakaryaspor have accused an Amed SK opponent of cutting a number of their players "with a sharp object" during a league game. They say a number of players went to hospital after the match with injuries. Sakaryaspor say players were also attacked as they inspected the pitch before their away match and again during the warm-up - with a player from either side red-carded before kick-off. They reported the attack to the police, claiming the referee did nothing. "After the match, our players were taken to hospital and it was proved that those cuts were caused as a result of an assault with a sharp object," a Sakaryaspor statement said. "The issue is completely in the hands of the justice system." 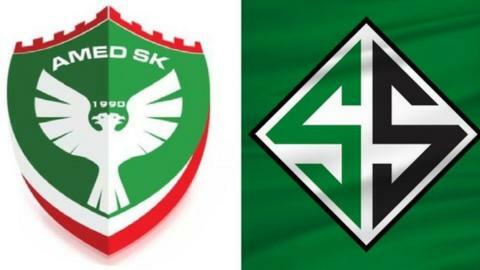 On social media, Amed SK say the claim "does not reflect the reality, it aims to target our club", accusing Sakaryaspor and the media of a "smear campaign". The story surfaced with allegations emerging via a local TV news channel, which reported a brawl on the pitch. The channel claimed an Amed SK (Amedspor) player used a razor to attack the opposing team's player. That created a swirl of attention on social media with the hashtag #shutdownamedspor trending. Sakaryaspor player Ferhat Yazgan posted a picture of what he said were injuries caused by a blade on social media and the club issued a statement about what they call "assaults" on their players. It is hard to determine the cause of Yazgan's injuries from the picture on social media - whether they came from a razor or from nail scratches sustained in a brawl. Amedspor's social media account published video of clashes between players after the game. How have Amed SK responded? Amedspor retaliated, saying the claims are baseless and do not reflect what happened on the pitch. They say the player did not have a razor or any sharp object in his hand, and it would have been impossible for him to do so. They accuse the local news channel of deliberately placing the watermark of their channel logo on top of the footage to make it difficult to determine if he is carrying anything. They also claim the Sakaryaspor management and fans verbally and physically harassed their players before and after the match. Amedspor represents Diyarbakir, the most prominent Kurdish-populated city in Turkey. They have encountered similar issues - especially when playing away from home. This game was played in Diyarbakir, but at the reverse fixture in Sakaryaspor's home town of Adapazari in the first half of the season, nationalistic songs glorifying the Turkish army were played. This was at a time when the Turkish army was conducting military operations in northern Syria against Kurdish militia. Two years ago, the Turkish military entered Diyarbakir, enforcing a curfew and conducting operations in the town against the Kurdistan Workers' Party (PKK) militia group. Adapazari is a small town in Turkey with traditionally strong support for President Erdogan. Nationalism runs high in the town - as in most towns in central Anatolia. The fans are vocal in terms of supporting the military and ongoing operations and it has created this political rivalry.